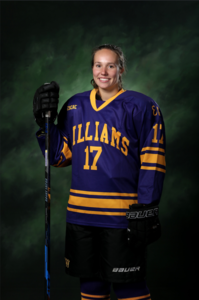 New Canaan Country School is pleased to congratulate alumna and Williams College sophomore, Meghan Halloran, who was named the New England Small College Athletic Conference (NESCAC) Women’s Ice Hockey Player of the Year for the 2018-19 season —only the third sophomore to receive the distinction in the history of the award. It was also announced that Halloran has been named to the 2019 NESCAC Winter All-Academic Team, having earned above a 3.50 cumulative grade point average. Halloran helped the Ephs claim the 2019 NESCAC Championship (notably scoring the game-winning goal in Sunday’s final) and earn a record-tying 20 wins for the season, the most since 2001. Also an All-NESCAC Women’s Ice Hockey First Team selection, she leads the league in points (36), goals (18), and assists (18). Founded in 1971, the NESCAC league consists of 11 liberal arts colleges and has consistently reflected its commitment to the values of athletics and academic achievement. The member colleges of the conference are Amherst College, Bates College, Bowdoin College, Colby College, Connecticut College, Hamilton College, Middlebury College, Trinity College, Tufts University, Wesleyan University, and Williams College. Raised in Darien, Meghan attended New Canaan Country School from 2003-2013 where she is widely remembered as hard-working and a leader on campus, in the classroom, and in her various athletic pursuits which also include lacrosse. “Meghan was a terrific player and teammate while she was at Country School. She led by example on and off the ice, and we are thrilled for her continued success and this well-deserved honor,” said Scott Lilley, New Canaan Country School teacher and varsity girls’ ice hockey coach. Following graduation, Halloran attended Deerfield Academy where she was the varsity ice hockey captain in both her junior and senior years and the varsity lacrosse captain, her senior year. During this time, Halloran received numerous distinctions including varsity ice hockey Most Valuable Player (2016-17), varsity lacrosse Coaches’ Award (2017) and U.S. Lacrosse High School Academic All-American (2017). She also received the William B. Jaffe Award for the student who exhibited courage, leadership and sportsmanship on the athletic field. Having secured the NESCAC league tournament, the Ephs are now in the NCAA DIII tournament and will play in the quarter-finals March 9. New Canaan Country School is a co-ed, independent day school for students in Pre-K (ages 3 & 4) through Grade 9. Located in New Canaan, the school serves families living throughout Westchester and Fairfield counties. For more information about the school, please visit www.countryschool.net.